Microsoft has launched Surface Go, an affordable 10-inch Tablet computer equipped with a built-in kickstand with full friction hinge that extends to 165 degrees. It has a custom-built 10-inch PixelSense display with a resolution of 1800×1200 pixels and supports Surface Pen with 4096 levels of pressure sensitivity. This tablet runs on Windows 10 with S Mode and available in two RAM configurations – 4GB RAM with 64GB SSD Storage and 8GB RAM with 128GB SSD Storage. The Surface Go is powered by the 7th Generation Intel Pentium Gold 4415Y Processor and offers up to nine hours of battery. For connectivity, it has Surface Connect for charging and docking, USB Type-C port for data, video, and charging. There is a 3.5mm Audio Jack and also a MicroSD card reader for storage expansion. The Windows 10 S Mode has access to the apps which are available in the Microsoft Store. You’ll not be able to Install the 3rd Party apps from any other source. Make a note that, if you want to install the apps from another source, you can switch to the full version of Windows 10 anytime for free. 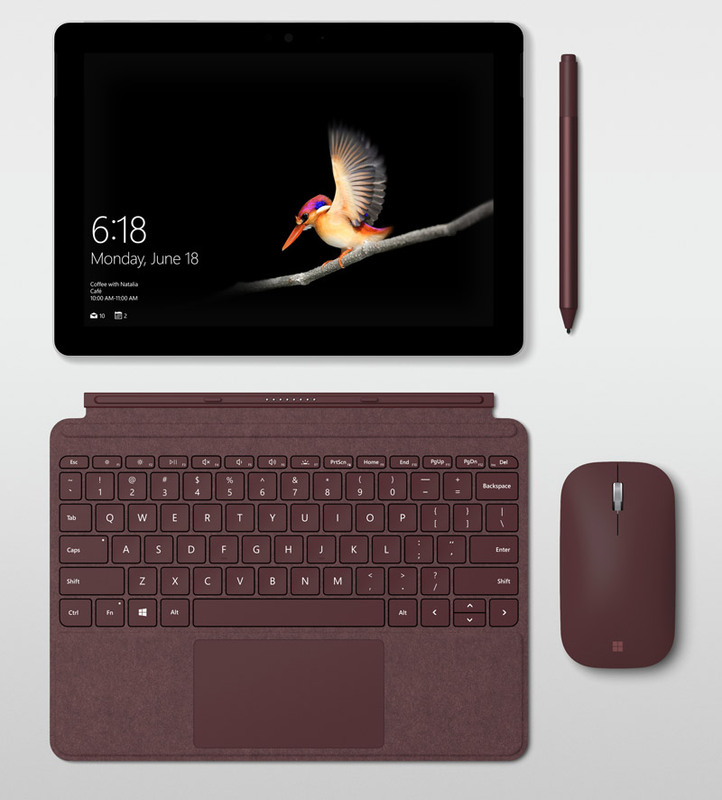 Microsoft has launched a few accessories such as Surface Go Type Cover ($99), Surface Go Signature Type Cover ($129), Surface Mobile Mouse ($34.99) and Surface Mobile Mouse ($34.99). The Surface Go Signature Type Cover is custom-made for Surface Go that comes with an ergonomic key and also Windows Precision Trackpad that supports five-point multi-finger gestures. All these accessories are sold separately. Microsoft Surface Go will be available for pre-order starting 10th July 2018 in the US, Canada, Australia, New Zealand, UK, Ireland, France, Germany, Austria, Belgium, Luxembourg, Netherlands, Switzerland, Denmark, Finland, Norway, Sweden, Poland, Italy, Portugal, Spain, and Shipping begins 2nd August 2018. In the coming weeks, Surface Go will be available for pre-order in Japan, Singapore, Korea, Taiwan, Malaysia, Thailand, Hong Kong, and in China with more markets to follow. The 4GB RAM variant priced at $399 (Approx ₹27,400) and the high-end 8GB RAM variant costs you $549 (Approx. ₹37,800). Microsoft has also announced that an LTE model will be arriving later this year.